Palliative Care in Oncology Symposium 2015 - Coming soon! In 2014, ASCO teamed up with AAHPM, ASTRO and MASCC* to present the first national palliative oncology conference and it was a huge success in terms of attendance and generating interest in cross-field collaboration. Two of our most popular Pallimed posts last year were reviews of the conference. #PallOnc became an established hashtag because of the online chatter about the conference. Check out the collection of good tweets here. Clearly that success begs for a repeat. The meeting will be held again in Boston on October 9 and 10, and registration is currently open. If you are doing work in this space, I would really encourage you to consider submitting an abstract (deadline June 23! ), because we need a good showing from palliative care clinicians. I know many of you are providing great clinical care, but don't forget to gather some data on your program's impact so we can demonstrate the need for integrated palliative care in oncology practices. 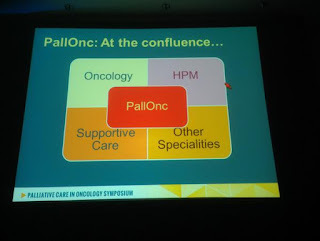 Who knows if this area of collaboration between oncology and palliative care keeps growing, then maybe we could convince the National Cancer Institute to make well-supported fully integrated palliative care teams part of the NCI Cancer Center designation**. Or maybe we convince US News and World report to place a larger emphasis on utilization (not just presence) of palliative care teams. *** Who knows! A boy can dream. So get going and talk with your team and submit your abstract! **There is only one mention on NCI's Cancer Center website of palliative care and it is in a PDF about the University of Wisconsin listing Jim Cleary's department. For a prestigious designation like NCI Cancer Center, surely we could encourage them to make palliative care a bigger priority. ***Palliative care is already included as part of their 'patient services' index, but it is only marking if there is a presence of 'palliative care' not about utilization.